Mein aaj is post me windows 10 ko activate karne ka ek simple trick aapke sath share karne ja raha hu jo ki bilkul free aur easy hai. Yadi aapke paas windows 10 operating system hai to aap is trick ki madad se expired windows 10 ko bina kisi charge free me activate kar sakte hai. Basically, main is post me aapko ek simple CMD trick batane ja raha hu jiski help se aap apne laptop/desktop ko keval ek click se activate kar sakte hai. Ye activation process Windows 10 Activator se complete kiya jata hai jiska procedure mein ne steps me explain kiya hai. But aage badhne se pehle hum Windows 10 Activator ke bare me thodi baat karenge. Windows 10 Activator Kya Hota Hai? Windows 10 Activator me ek product key hota hai jo ki run karne par hamare computer ki expired product key ko new product key ke sath replace kar deta hai. But iske liye hamare paas active internet connection hona chahiye otherwise ye work nahi kar payega. Jab hum cmd ko run karte hai to isme kuch computer commands hote hai jo activation process ko automatically complete karta hai. Yadi aapke paas product key available nahi hai to don't worry. Kyunki is trick me aapko product key ko manually add karne ki zaroorat nahi padti hai. 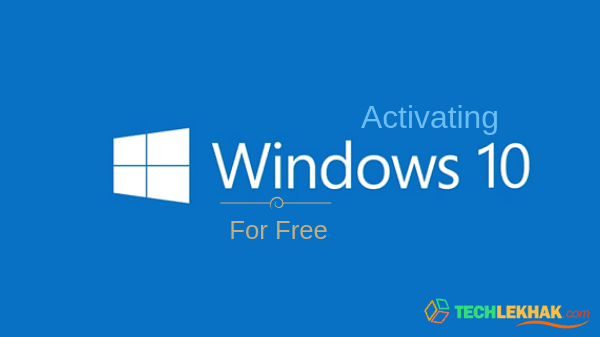 Let's activate your windows 10 for free. Step 1. Sabse pehle apne PC ko internet se connect kare warna ye trick work nahi karega. Step 2. Iske baad is link par click kare aur diye gaye code ko copy karke NotePad me paste kare. Step 3. Paste karne ke baad file ko as a batch file save kare aur iska naam windows10.cmd rakhe. Yadi file save karne me koi issue aa raha hai to don't worry. Let's save your file first! NotePad me code paste karne ke baad, filename option me windows10.cmd add kare aur save as type me All files select kare. Ye sab karne ke baad apni file ko desktop par ya phir kahin par bhi save kare. Step 4. File save karne ke baad, windows10.cmd par left click kare aur "run as administrator" par click kare aur iske baad YES select kare. Step 5. Activation process complete hone me 1 - 2 minutes ka samay lag sakta hai. Aur finally, last me "activated successfully" aayega. Congratulation! ab aapka pc valid product key ke sath activate ho jayega. Ab me aapko ye bhi bata ke chalu ki in steps ko follow karne se aap windows ko free me activate kar sakte hai jaise 32 bit aur 64 bit. Is trick ko apply karne se aapka Laptop/Desktop Windows 10 Professional, Windows 10 Home, Windows 10 Enterprise aur Windows 10 Education me activate ho jayega. Activate hone ke baad, aap apne PC ko fully customize kar sakte hai. Bonus tip: Bahut sare windows user software download karke apne computers ko activate karte hai but meri suggestion hai ki aap log sahi aur official product key ke sath hi apne PC ko activate kare jo ki is post me mil raha hai aur woh bhi free me. No software required!